Overhead absorption Rate also called Overhead Recovery. Service centers the cost of operating support departments or sections within the factory, for example, the costs of materials handling, production control etc. An item of expenses which can be directly related to a cost centre is to be allocation to the cost centre. For example , depreciation of a particular machine should be allocated to a particular cost centre if the machine is directly attached to the cost centre. When factory overhead expenses are not identified with a specific product, they are charged to product by a process of overhead allocation. Allocations may be made for each item of expense incurred and the allocations made at the end of the accounting period. The purpose of cost accounting is to provide information to the management. Management need to know cost per unit as a basis for decision making. A manufacturing business operates with two production departments P and Q and a department S. It manufactures soup and shampoo. It incurs the following costs in a given period. A general cost in a manufacturing company is factory rental. Annual rental costs are Rs. 80,000. How this cost should be apportioned between production cost centres and services cost centres? 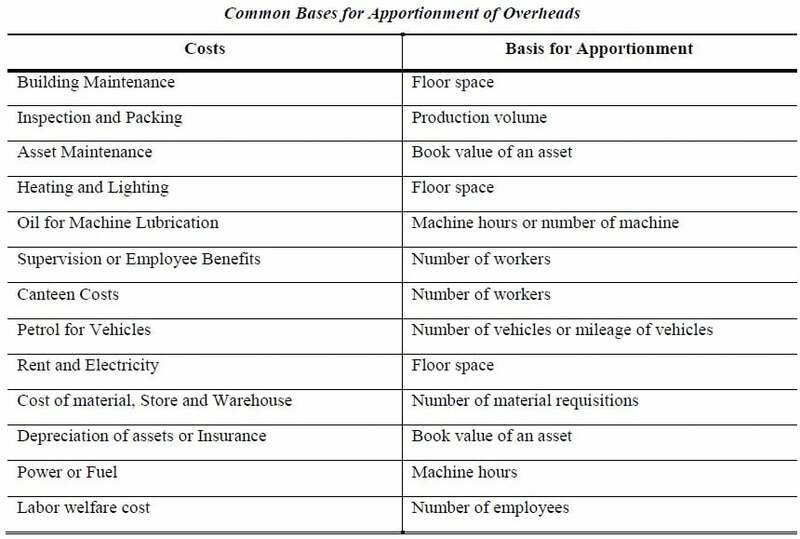 Rental costs are usually apportioned between cost centres on the basis of the floor space taken up by each centre. Suppose that three cost centres have floor space of 50,000 square meters; Production cost centre (A) has 10,000 square meters, Production cost centre (B) has 15,000 square meters and Service cost centre (C) has 25,000 square meters. >> Further Practice: Process Costing Problems and Solutions. However, change in basis for apportionment can be adopted only when it is considered necessary due to change in circumstances like change in technology, degree of mechanization product mix etc. 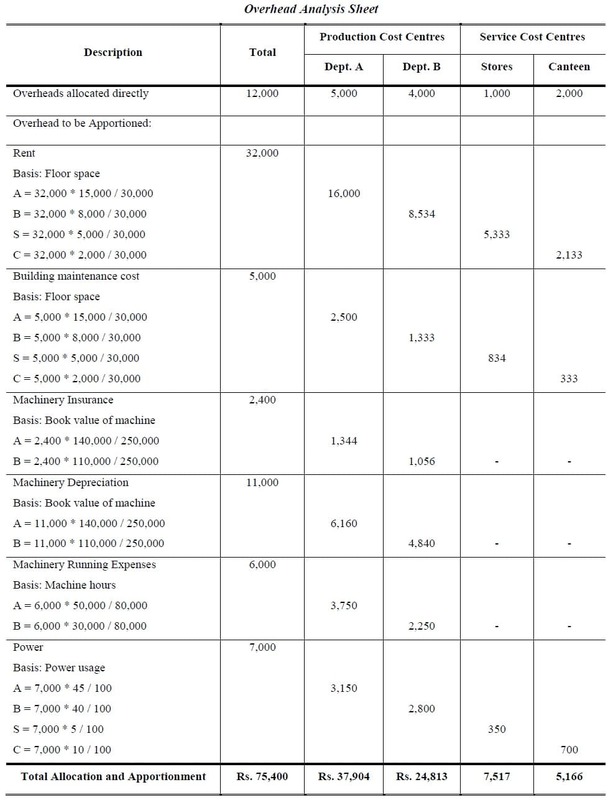 Required: Allocate and apportioned the cost to the four departments by making Overhead Analysis Sheet? 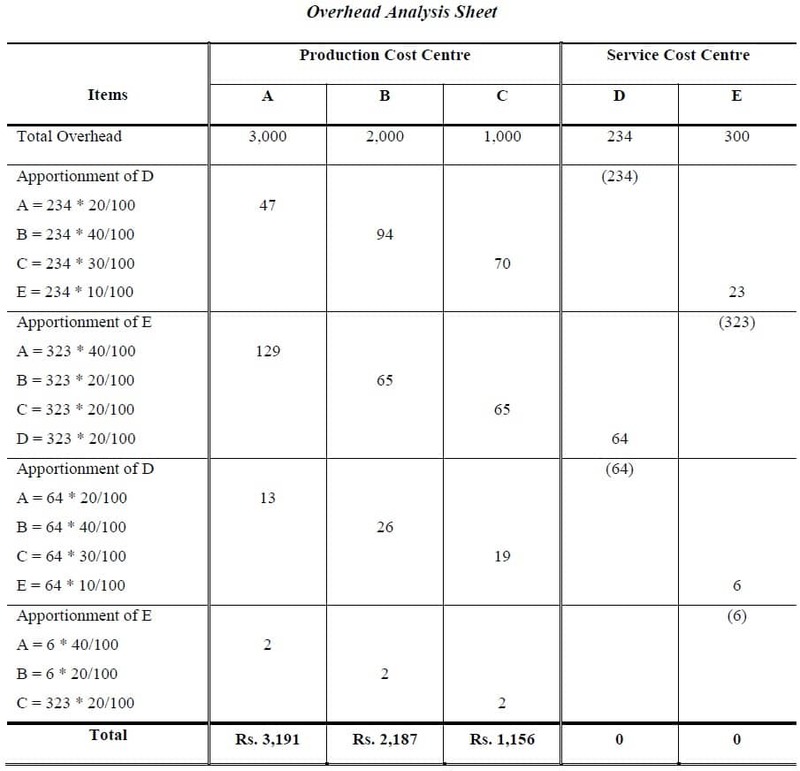 Requirement: Show how the service cost centre costs should be re-apportioned and the resulting total overhead costs of each production cost centre assuming that store cost centre does not work for canteen and canteen does not work for store cost centre? Some organizations use the step-down method, also called the sequential or repeated allocation method. Which allocates services-department costs to other services departments and to production departments in a sequential manner that partially recognizes the mutual services provided among all service depts. (Reciprocal pportionment). Distributes service department costs regressively to other service departments and then to production departments. 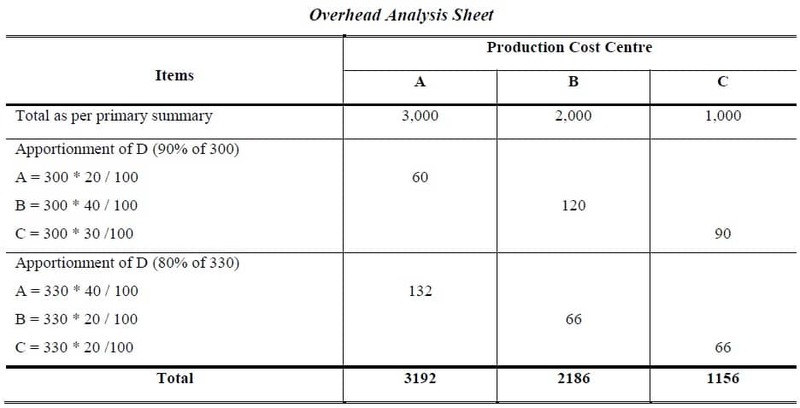 Requirement: Find out the total overheads of production departments by step-down method? It is also reciprocal apportionment using equation. Distributes costs by simultaneous equations recognizing the relationship of services rendered by departments to each other. Requirement: Find out the total overheads of production departments by Algebraic Distribution Method? The Company estimated that it would incur Rs. 320,000 in manufacturing overhead costs and would work 40,000 direct labor-hours. What is the company’s Overhead Absorption rate?